Into The Box 2018 is going to be an extravaganza of coldfusion madness with over 25 + different speaking sessions and 4 hands on workshops April 25th-27th in The Woodlands, TX! Our speakers include our very own Ortus team and others from all around the globe that are a huge part of the CFML community. This week we wanted to inform you that one of our most popular workshops, Coldbox 0–Hero has already sold out, but we have good news! We have decided to add another assistant and make room for 5 more attendees! So get your seat before it's too late! But you might be wondering what exactly does it look like to go from Zero to Hero? Workshops + Group Hotel Discount | 10 Weeks Away From Into The Box 2018! Into The Box 2018 is just around the corner and our Early Bird Special is ending soon! So if you haven't made your purchase yet, the sale ends February 25th! Our event will be hosted at the Hyatt Placein The Woodlands, Tx April 25th–27th. To receive a discounted group rate on room reservations call @ 855-312-7268 or visit their website and enter the group promo code G-ORSO! We are incredibly thankful to be hosting another year and look forward to exploring the latest advancements in the CFML community with you all! We are offering Into The Box Early Bird Pricing only up to the 25th of February! Hurry and purchase your seat soon as time and spots are running out! Also for this week we are continuing with more speaker highlights featuring 3 more of our awesome keynotes! Only 13 Weeks left + More Speakers Highlights! Get ready for Ortus' Into the Box 2018 by getting to know our speakers! With only 13 weeks to go, hurry and sign up today. 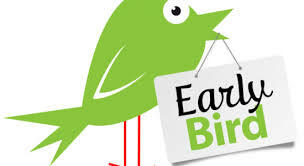 The Early Bird special is endind soon, February 25th! Sign up today!